Each night I face the same dilemma. I cook recklessly, stringing mixing bowls, pots and pans, and utensils around like they are some type of impromptu kitchen decoration. I do anything to get the meal on the table and bellies full, but then I dread the next, inevitable task: cleaning the dishes. The only thing worse than slaving away on a meal is knowing that the mess you made awaits you. 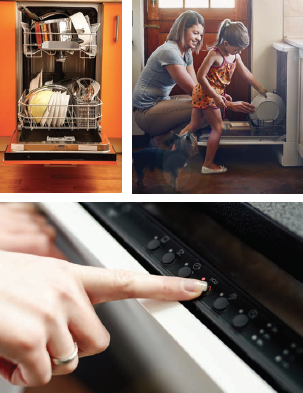 Let’s skip the dishes tonight and instead compare the many options and features you could have in a new dishwasher. First, find a dishwasher that will fit your kitchen’s unique layout. Measuring your space and learning the dishwasher’s full height range (including the leveling feet) is recommended. Remember, if you tiled your kitchen or upgraded your countertops, your dishwasher cavity dimensions could need some extra attention to be sure it is ready to house a new appliance. The first and most popular size option is a standard built-in dishwasher, designed to fit within a space that’s 24 inches wide, 24 inches deep and 35 inches tall (with adjustable leveling feet). These appliances continue to be a household favorite, typically holding 10 to 14 place settings and accommodating a variety of large platters and baking dishes. Full-size dishwashers cost anywhere from $300 to $2,000 and beyond. Although this appliance is the largest size contender within the dishwashing world, many models also come equipped with a small-load option. If your household never seems to produce enough for a full load of dishes, you can save time, money and water by utilizing a compact 18-inch dishwasher. These kitchen upgrades pack the same cleaning punch as their full-size counterparts, but in a more space-friendly package. Compact dishwashers typically accommodate eight place settings and cost anywhere from $350 to $1,500. Many 18-inch units are Energy Star-rated and require less water, which means your energy bill (and the environment) will get a welcome break with these efficient, minimal-emission units. Another option is dishwasher drawers. These units are 24 inches wide and are loaded with a variety of benefits including quick, energy-efficient wash cycles. They can handle about seven place settings per drawer, and you can choose to use one drawer or stack multiple drawers, depending on your household’s needs. Multiple-drawer units can function independently, so delicate glassware in the top unit can be treated with a different wash cycle than rugged dinner plates in the bottom, for example. A single drawer usually costs $600 to $900, while a double-drawer unit could cost anywhere from $1,000 to $1,500. Regardless of dishwasher size, there are many additional features and functions available with these cleaning machines. Once you have determined which size dishwasher best fits your kitchen’s layout, you can then analyze which specific features perfectly suit your needs. Adjustable Racks: Racks, tines, and silverware and stemware holders that move based on your family’s dinnerware preferences can be a huge bonus when your table’s contents fluctuate. For instance, non-adjustable racks may be fine for everyday cleaning, but when entertaining a crowd, a larger serving dish may not fit without moveable racks. Some dishwasher units may also allow for the movement of individual sections of the rack to accommodate oddly-shaped dishes. A Variety of Sensors: Several dishwasher models are equipped with smart sensors which adapt to a load’s soil level to adjust the cycle’s heat, intensity and cycle duration. In a world dominated with choices, this feature takes the guesswork out of how to get your glasses back to pristine condition. Bacteria Fighting: Many dishwashers offer a mode which is designed to kill germs on your dishes. The cycle is based on standards developed by National Sanitation Foundation International to remove 99.99 percent of bacteria using superheated water. This option is ideal for cookware which may have touched raw meat, like cutting boards, or sensitive items such as baby bottles. Filters: Each dishwasher comes with either a manual or self-cleaning filter. Although convenient, self-cleaning filters tend to be noisier as food is pulverized to travel down the drain. Manual filters are quieter, but will need to be emptied to avoid developing odors. Decibel Levels: Pay close attention to decibel ratings (the lower the number, the quieter the machine). Note, however, that decibel ratings are averaged throughout the entire cycle (including the silent drying process) which can skew these numbers. 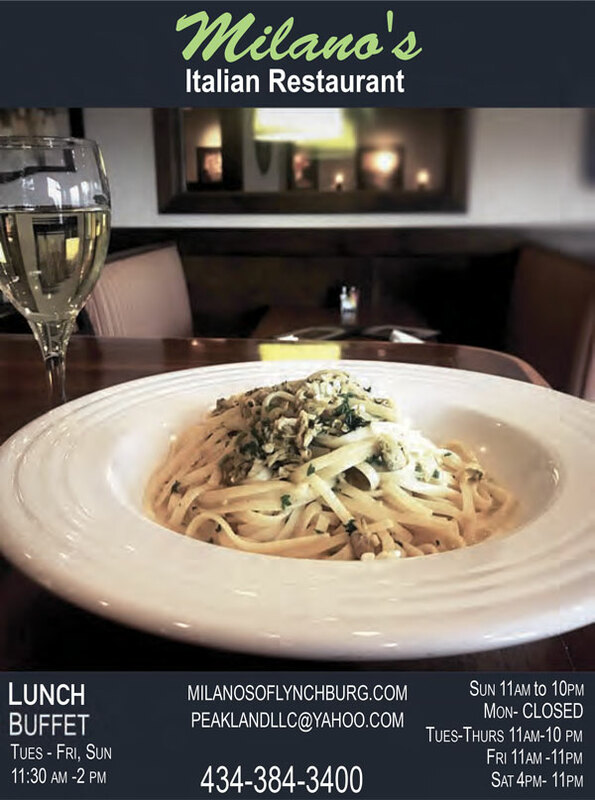 Stainless-Steel Tub: Many dishwashers are offered with a stainless-steel tub as an upgrade, and while this may seem mission critical, plastic tubs will typically outlive any typical dishwasher’s service life. Stainless steel will resist staining better than plastic, but if your wallet is screaming at the idea of another upgrade, consider a gray-speckled plastic tub to aid in hiding any residue. Style Options: Finally, there are many style options available, such as panels designed to match your cabinets, a front window to watch the cycles in motion, hidden controls, or a cycle timer which displays on the floor. Look around at different brands and styles to see what model feels most at home in your kitchen. A dishwasher can be as basic or as advanced as you desire. Modest dishwashers can perform just as well as their higher-priced rivals, but you may sacrifice noise levels and other helpful features. When deciding what model works best for you and your family, carefully consider your kitchen’s size and the additional features you most desire. 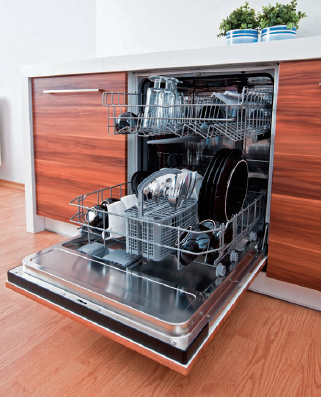 After a long day, you may find an upgraded dishwasher holds a quick return on investment.